Nuestra Señora de Belén (Our Lady of Bethlehem) was the name bestowed in 1740 to the land grant and first settlement of Belén. 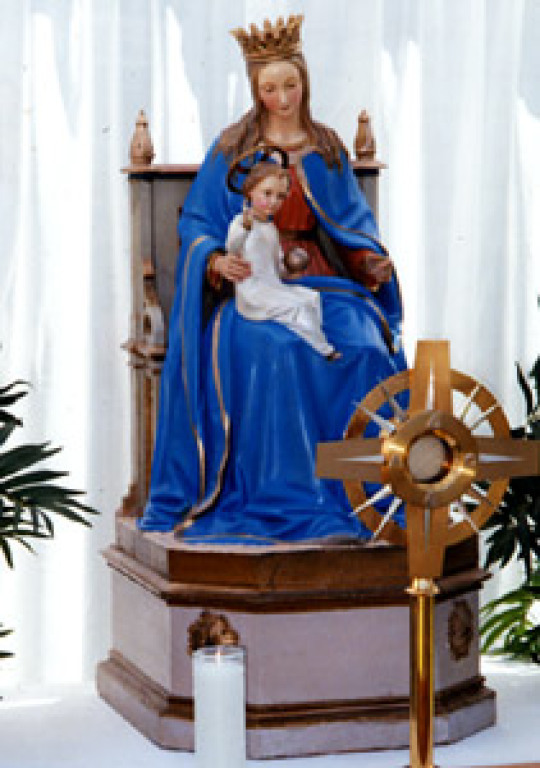 The name is a reflection of the intense devotion to the Mother of God that was felt by the colonists. Mariology, belief relating to the Virgin Mary, has evolved over time, just as Catholicism has changed in practices and beliefs. Several events are prominent in Mary's life. First, Mary gave birth to Jesus in a stable in Bethlehem (Belén). The Immaculate Conception of Mary refers to the belief that she was free from original sin at the first instant of her own existence in her mother's womb. The Annunciation is the announcement made to her by the Angel Gabriel that she was to be the mother of Jesus Christ. Assumption of Mary is the doctrine that her body and soul were taken by angels to heaven to be with Christ. The Virgin Mary has long been celebrated by artists and musicians and her life is the subject of some of the greatest masterpieces ever created. Apparitions of the Virgin such as the Guadalupana appearing to Juan Diego in Mexico City in 1531, to a peasant girl in Lourdes, France in 1858 and three children in Fatima, Portugal in 1917 have stirred renewed devotion to Mary.